Thanksgiving greetings one and all! Dave Willauer, host of my school district's very own Ram Country TV show, gave me the opportunity to talk Disney Animation with him. Each show highlights events and people within the district's community, and my being a teacher in the district, Dave thought a special on Disney would make for an interesting episode. Those who know me are aware of my keen interest in Disney Animation. The episode embedded below clearly speaks for itself. 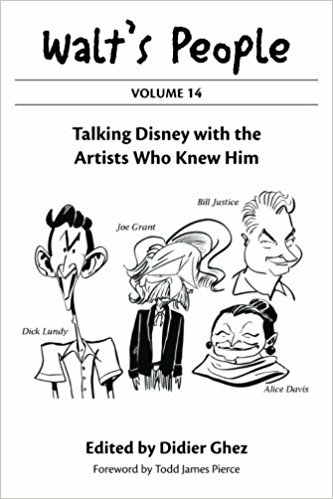 This episode begins with a very brief history of aspects of the Walt Disney Studio and builds up to my relationship with the late Disney artist, Ron Dias. A second episode is in the works, and its focus will be on Dias alone. I feel the episode came out well, and Dave certainly kept me at ease. When asked about the "nine old men" of Disney Animation, I knew Walt himself coined the term, while making a reference to a piece of American history. I could not remember for the life of me while filming. President Franklin Roosevelt had nine Supreme Court judges who he called his "nine old men." This is where Walt Disney got the term for his nine "supreme" animators. When watching this episode, there is one mistake. When I'm talking about Ron Dias three quarters in, the second picture insert is of animation historian, John Canemaker, not Dias. No matter where your love for Disney or film falls, I hope you enjoy the following Ram Country video. It was so kind of Dave Willauer and the district's studio manager, Andrew Rothermel, to provide me this opportunity. I look forward to showing you all Part 2 in the near future.